The Australian Transport Safety Bureau (ATSB) has released its investigation report into the loss of separation involving two Boeing 737 aircraft and a helicopter near Essendon Airport. On the morning of 26 January 2016, the air traffic controllers at Melbourne Airport, Autralia, conducted a runway change from runway 16 for arrivals and runway 27 for departures to runway 16 for arrivals and departures. The Melbourne Tower Coordinator and the Melbourne Approach East Controller were required to coordinate the runway change with the Essendon Aerodrome Controller as Essendon lies about 8 kilometers southeast of Melbourne Airport. However, both Melbourne controllers forgot to conduct the coordination. At Essendon Airport, the pilot of a Robinson R44 helicopter, registered VH-WYR, had been cleared to operate overhead the airport, not above 1,500 ft, as there were overcast conditions above that level. At 07:05 local time, a Boeing 737 was cleared for take-off on Melbourne runway 16. About 1 minute later, another Boeing 737 was cleared for take-off on the same runway. The Essendon Aerodrome Controller observed the first Boeing 737 departing runway 16 on their Tower Situation Awareness Display. As the controller was unaware of the change of runway at Melbourne, they believed the Boeing 737 was an uncoordinated missed approach. Shortly after, the second Boeing 737 departure appeared on the display. The Essendon Aerodrome Controller queried the active runway with the Melbourne Planner Controller, and found out that the active runway had been changed at Melbourne Airport without the required coordination with Essendon. At 0708, the Essendon Aerodrome Controller instructed the pilot of VH-WYR to operate over or to the east of the Essendon runway 26 threshold, ensuring a 3 NM (5.6 km) separation with the runway 16 departures from Melbourne Airport. A review of the surveillance data confirmed losses of separation between ther helicopter and the two Boeing 737 aircraft. At their closest, the first was 2.4 NM (4.4 km) west of and 800 ft above VH-WYR, the second 2.5 NM (4.6 km) west of and 800 ft above. Either a 3 NM (5.6 km) surveillance separation standard or a 1,000 ft vertical separation standard was required. 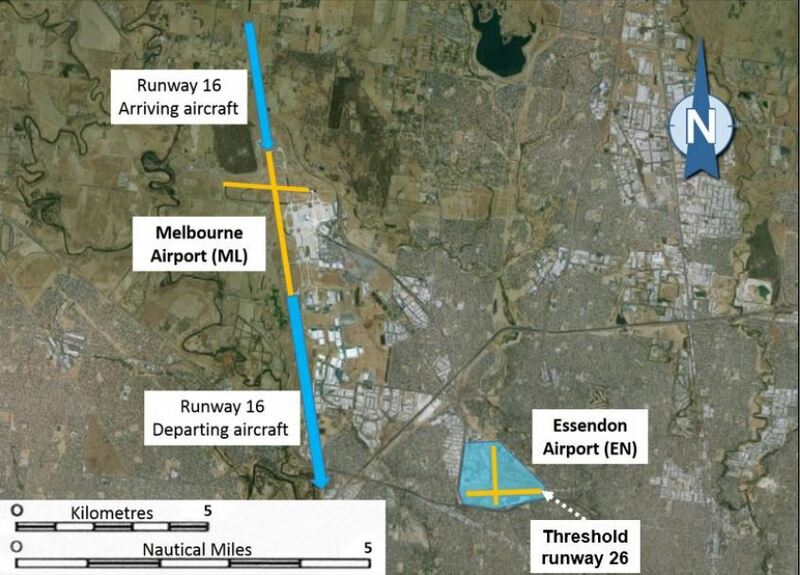 The ATSB found that, while there were requirements for coordination between Melbourne and Essendon Airports, there were no documented procedures, checklists, tools or memory prompts to assist controllers to coordinate runway and airspace changes. In this case, the Melbourne Tower Coordinator and Melbourne Approach East Controller each forgot to conduct the required coordination with the Essendon Aerodrome Controller. Neither controller could explain this lapse.